Sitting At The Foot of the Mountain: Where Do You Take Refuge? I have written before of the little frogs that inhabit our area. It still amazes me—little green frogs in the high desert. Not toads, mind you, but little frogs with soft, moist skin living in an area that is experiencing 100 degree days this summer. I see no running water, and yet I find them all over my house. I mean, literally. I have a little plaque outside my door, and it is about a quarter of an inch away from the house, hanging on a nail. Sure enough, underneath that plaque, is a little frog—hiding. I can see it under there and every day when I go in through my front door, there it is. Another little one grew too big to hide under it, and now another one is there—it is a small tight space, but still provides refuge. When it is really hot, I will pour a bit of water on the wall, and it will run down under the plaque. I remember studying frogs as a kid, being reminded that toads don’t need water, but frogs need it to keep their skin moist. So, I feel so sorry for these little green neighbors that I try to help out. Imagine my surprise then when I moved my large round outdoor thermometer, and underneath it, hiding in the thermometer itself, was a gathering of little frogs, of all sizes! One time, my son and I counted five of them, all nestled together, in this thermometer! The thermometer was smack dab in the afternoon sunshine, and we put them on our cool patio table, thinking it would be safer for them to be on it. We even put some water on the table for them. Were they content? No. Within a few minutes, they all had made their way off the table, crawled up the wall and went back under the thermometer. Despite our best intentions, these little green guys seem to know where it is safest to go, in such dry and unwelcoming conditions. Even if we think we know what’s best for them, they seem to resist our efforts, and go back to where it is safest for them. Perhaps the dry air is not nearly as perilous as the birds that could swoop in and grab them. Near a stream, their natural hiding place may be under rocks, so up on my hill, my house became a challenge: find the rocks! And so a plaque and a thermometer became reasonable substitutes—providing the same kind of hiding place. A bird could not get a frog underneath the thermometer, if the bird even knew the frog was there. The plaque? No—too small area for the bird to reach into and where would it perch to do its hunting? In a word: brilliant. 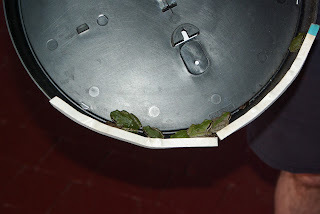 The frogs have figured it out and are grateful (I’m sure) when I leave them alone. Where do we take our refuge? The world offers all sorts of ideas to take residence in, and some are genuinely offered. If you make a lot of money, your wealth can be your cushion! If you have a good job, you will be more content! If you have a good family, you have all you need! Are these unreasonable ideas? No, but let’s think about them from a frog’s point of view. Money can disappear, like the water I pour on the frogs. Jobs can be lost and family—because the members are human after all—can disappoint us. But where is the safest place to take refuge, away from the swooping birds of sin and disappointment? Under His thermometer! The Scripture talks about hiding under the shadow of His wings—the safest place for a baby bird, whose own wings are too weak for it to safely fly away from danger. The shadow provides coolness, and David wrote his psalms in a land that has deserts all around it. He takes of taking refuge on the rocks—the places in the desert where the elevation allows you to see all around you, and a cleft rock allows you to hunker down, and be safe. Bottom line: God is our refuge, our Rock, our Shelter. The frogs seem to know where it is safest, contrary to what I think. But God’s creation is a lot smarter than I am and His Word tells me that I should take refuge in Him alone. I need to be like those frogs and put myself daily under His care. I will not be disappointed. Oh, Rock of Ages: Let me hide in You, pure and simple. There may be many well intentioned ideas floating around out there that promise me safety, but it is in You that I will have the surest Refuge. Thank You for these little green ambassadors that teach me where to go: under Your protection and love. In the name of He who died for me, amen.